August 8, 2015. On yet another miraculously sunny day, Matthew and I had the opportunity to go for a boat ride with a colleague of ours who’s an avid fisherman. A native Floridian, Barry has always lived along the Intercoastal Waterway, and the thought of enduring Norwegian winters and not being on the ocean was beyond bearable. So he rented an island house with a dock and bought a small pontoon boat shortly after immigrating. 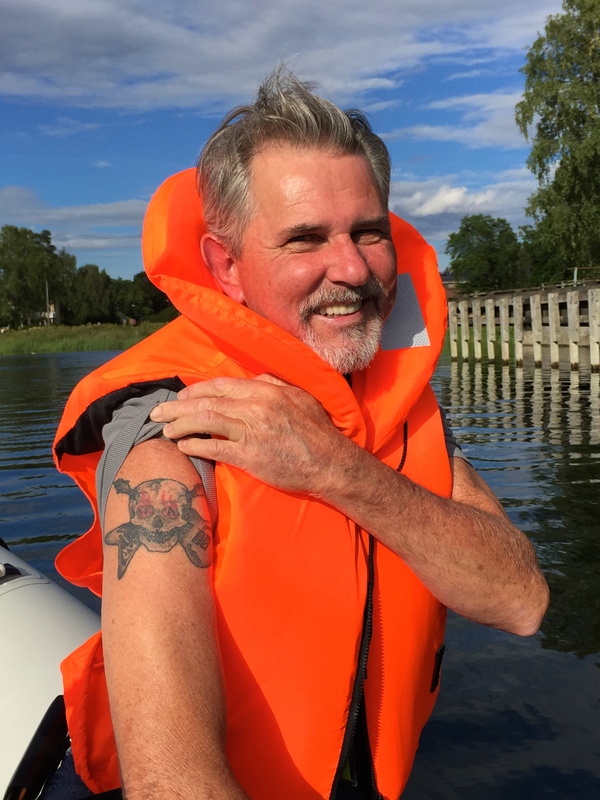 Barry shows off his recently acquired tattoo featuring two of his favorite guitars — he plays and is a collector. To his credit, Barry generously shares his good fortune with everyone on the job site. And who wouldn’t be thrilled about the opportunity to take the “Codfather,” as the boat is fondly nicknamed, out for a spin? Matthew and I had been trying all summer for our turn at the helm, but our schedules and the weather had never aligned. Finally, a day arrived when everyone’s calendars jived and the sky seemed promising. 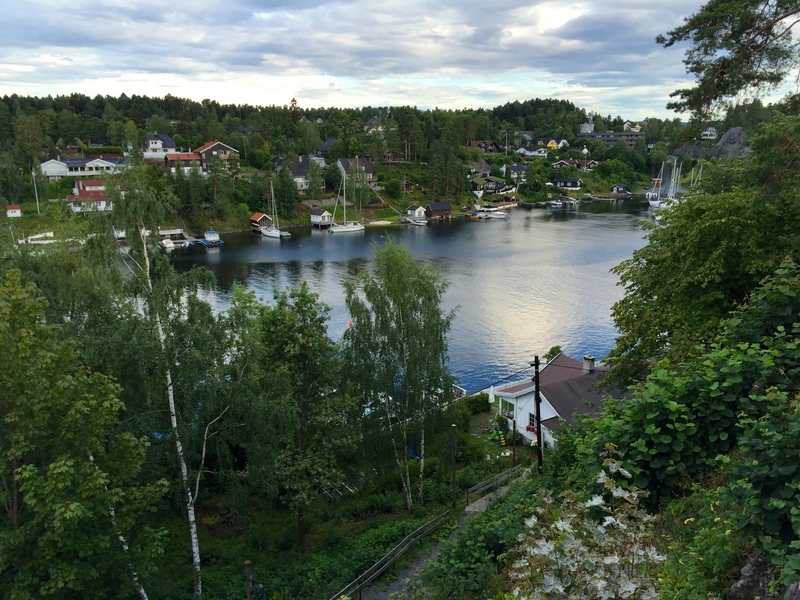 Of course, as we piled into the car for the ride to Barry’s house, a sudden downpour threatened, but we adopted the Norwegian attitude of “wait five minutes and the weather will-change” and took off for the island. The hobbit-like playhouse designed by an architect. Heading into his neighborhood, Barry pointed out some of the local opulence … and some of the oddities. Turns out, this study in contrasts was to be a theme during the trip. 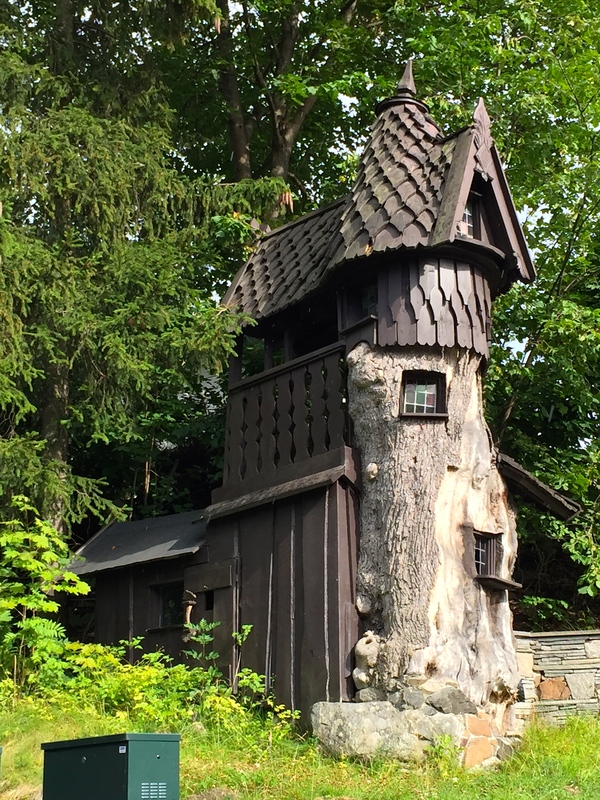 One guy had built a gorgeous, traditional, Norwegian log house … and then added a hobbit version in the backyard. Another family had erected a modernized glory worthy of the Jetsons … right next door to a quaint little cabin that would have looked at home in Appalachia. 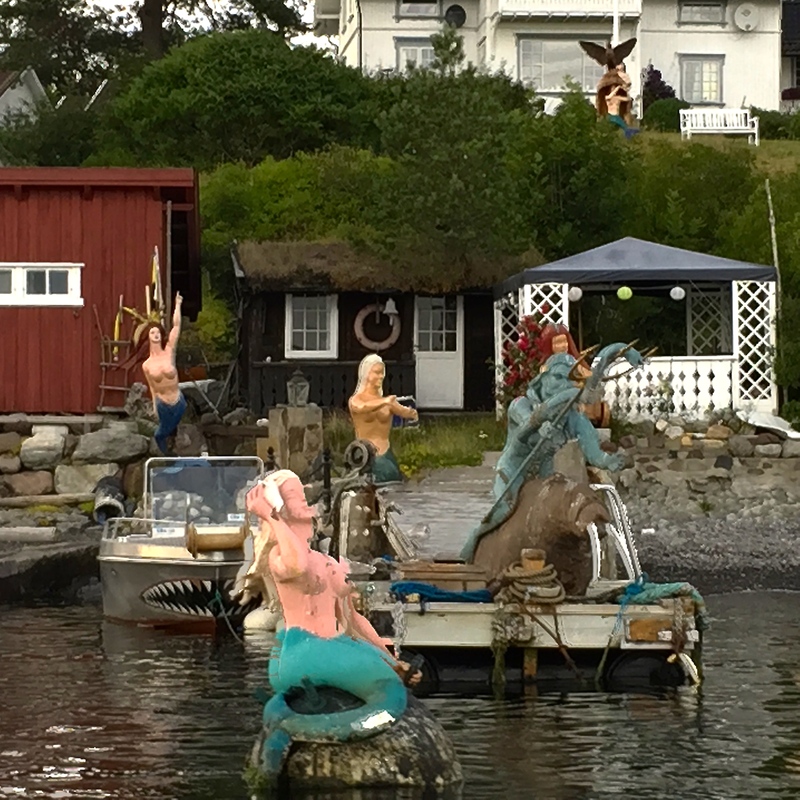 Barry had the best of all worlds, a spacious but comfy two-story with the most fantastic view over the fjord anyone could ask for, and I could see why he loved the place and would be sad to relocate soon, since the owner was preparing to move back in. The view from Barry’s back porch. We hiked down to the dock and took a few moments to peer into the water. Starfish in orange, purple, and red — most with about ten arms, some monster-sized individuals spanning the width of a dinner plate — clung to the rocks near the shoreline. A huge crab combed the pier for some munchies. Sea urchins congregated in a giant clump. And suspended on a piece of drifting seaweed was the strangest and frankly most pornographic sea creature I’d seen in a long time. 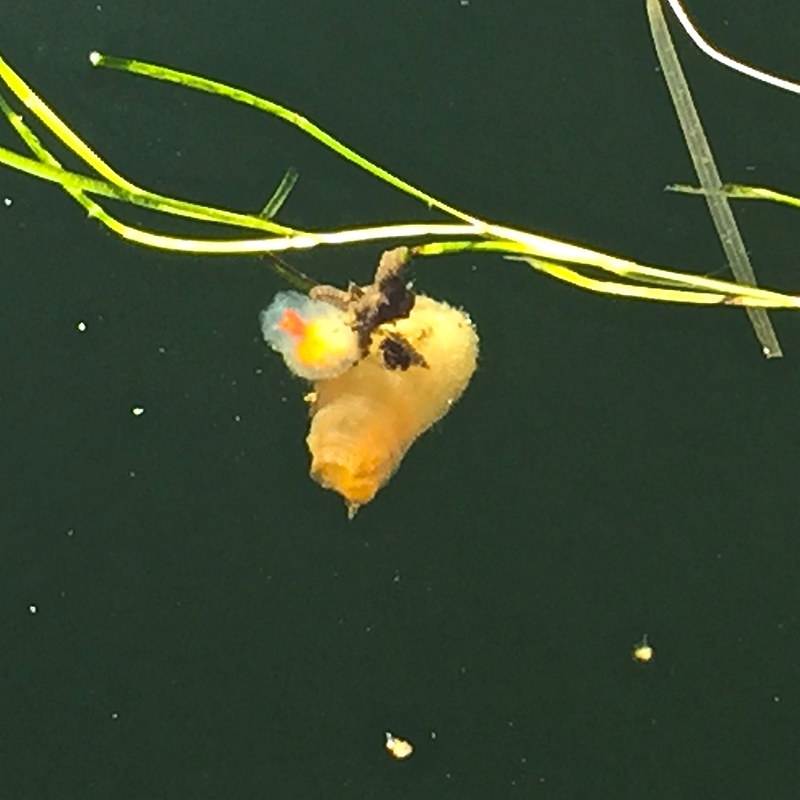 At first we thought it was a used condom, but when we began to fish it in, intending to dispose of it, we realized that it was startlingly, throbbingly alive. Maybe a sea cucumber? We can only hope …. No idea what this x-rated life form is. Anyone? Anyone? Check out the modern home and matching boat house. 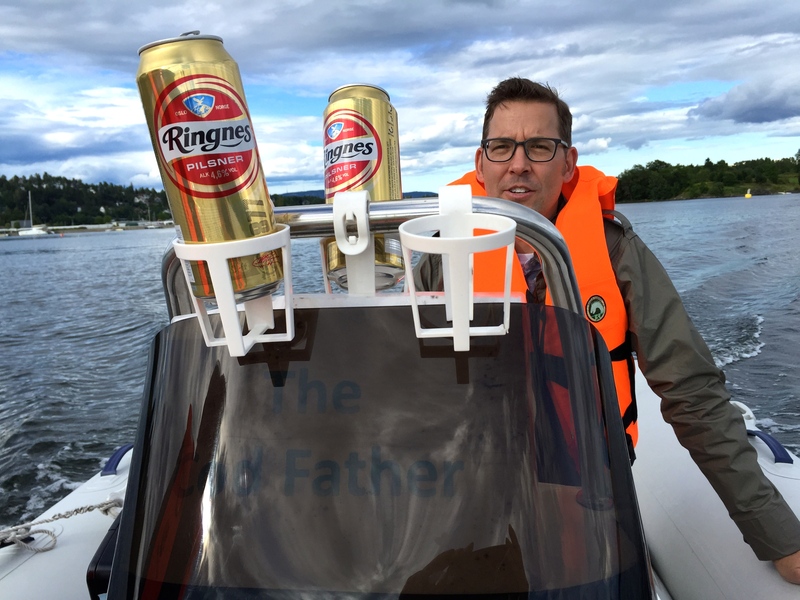 Feeling more than fine after all the fresh air and Ringnes, Matthew takes the helm of the Codfather. Some of my favorite tales include the night that he and a buddy chased a sea plane that was taking off, just to see how long they could keep up and film it. 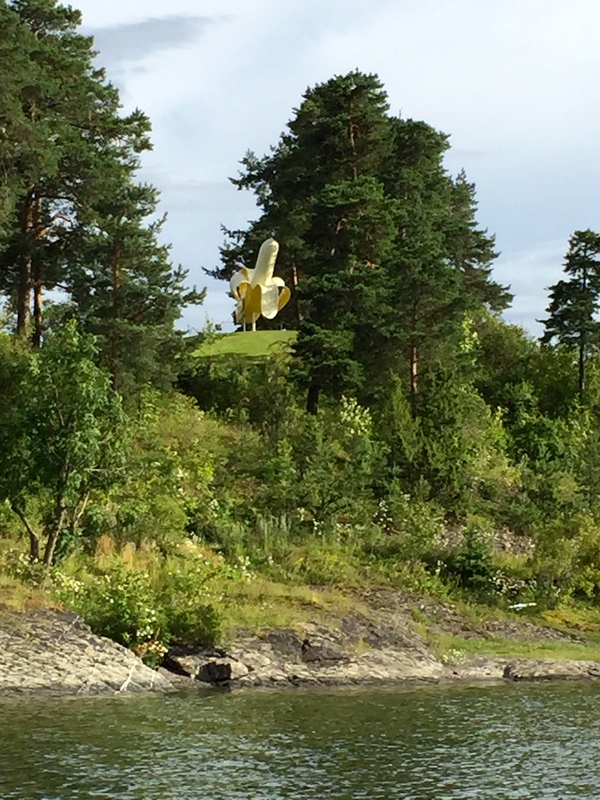 And the one about the first night he took the boat out and got lost in the fjord, since one island looks like the next, until he spotted a giant yellow banana on a bluff. Nope, not a bourbon-induced mirage, a reclaimed factory logo that now ornaments the grounds of a modern museum of art. It has since become Barry’s beacon home. Barry’s banana beacon beckons from shore. Perhaps the best story is the one about Royal Princess Ingrid Alexandra, the 11-year-old daughter of Crown Prince Haakon. The tale goes like this: Barry and his buddy like to motor out to remote spots and cast a net to see what they can catch. One afternoon, Barry got a call from the guy, who explained that the princess was attending his daughter’s birthday party and had expressed an interest in going with them to pull in the net. Of course Barry said yes, but he thought his friend’s swanky antique boat might be a better choice of vehicle. “No, the princess would prefer the Codfather,” was the answer. Before the trip, Barry met with the Royal Guards who would be accompanying them. “Is there anything I should know?” he asked. “Yes, we know how to do our job,” replied the square-jawed captain. So off went Barry with his friend and a boatload of 11-year-olds, including a royal. He gave each kid a chance to drive the Codfather, and curious to see how the hovering PT boat would react, he encouraged the princess to try some donuts. She loved it, but no reaction from the guards. Guess it’s not the first time. Two young’ns crank their way to freedom. Barry said, “When it came to hoisting in the nets, the princess got right in there, pulling and tugging for all she’s worth. And she grabbed these huge fish with gusto, not a bit afraid to help us empty the nets.” I asked if she helped gut and clean the fish, too, but he said she had to get home to attend a dance recital. From what I’ve heard, the royal family wants to keep her connected with the people so that she has as normal a life as is possible, and it sounds like they’re doing a great job. 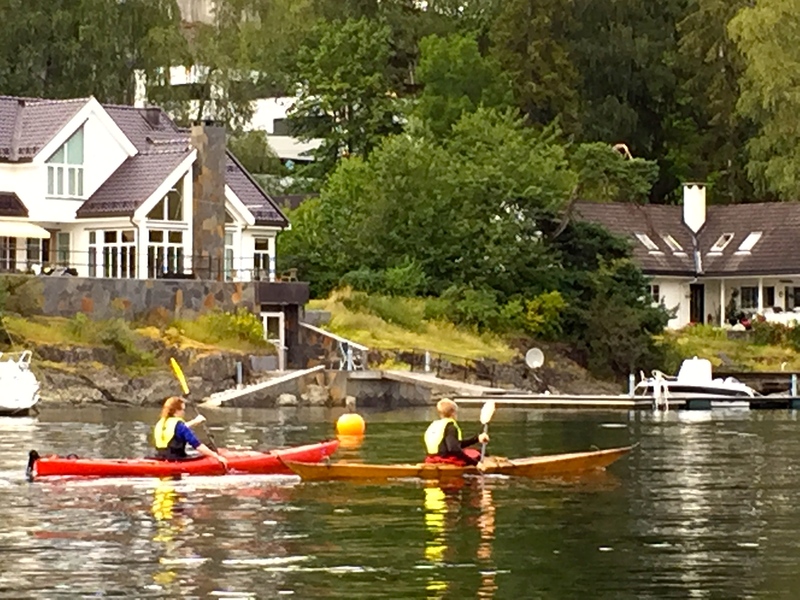 Kids kayaking sans parental supervision. What a life…. As we turned for home, Barry pointed out one last oddity — a hand-cranked ferry designed to carry folks across the short span from one island to the next. Two ten-year-olds cranked away, guided to their destination by an anchored rope, no parents in sight. A few minutes later, two kayaks manned only by preteens passed us. 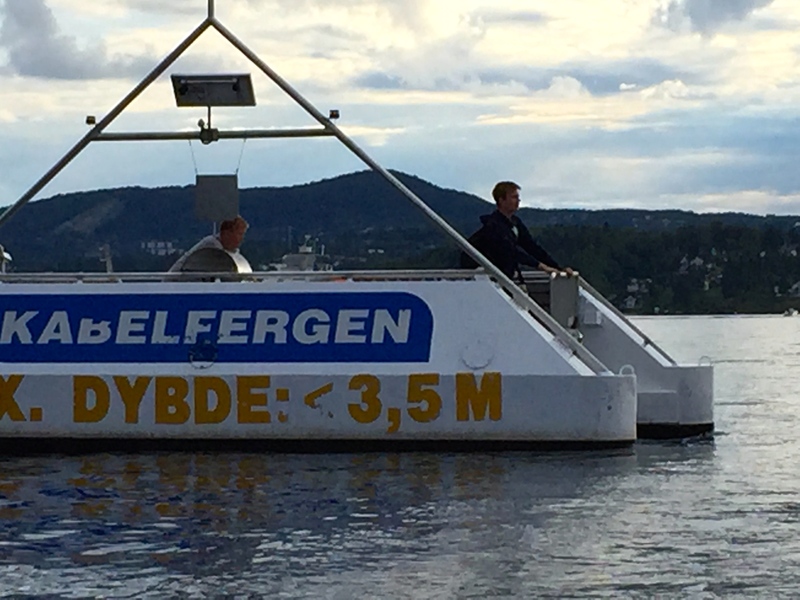 It seems Norwegian kids are fiercely independent and have parents with nerves of steel. Nearing the dock, we ran across a pair of white swans that were cruising the pier for some supper, and high above, a flock of them whirled overhead. Barry’s response was, “What more could you ask for — see why I could do this cruise everyday?” I do, Barry, I do. I think this may be a Tundra Swan (Cygnus columbianus), perhaps the subspecies “Whistling Swan,” so-named for its funny honk. Tundra Swans migrate a bit further south, to the Netherlands and Denmark, for winter. One of the picturesque bridges we passed beneath on our trip. Wishing we could do this every day!